We are pleased to introduce the Sony UP-897MD Analog Monochrome A6 Medical Grade Printer with a BNC interface. Sony's smallest ultrasound printers ever, the UP-897 models measure only approximately 6 inches wide x 3 ½ inches high x 9 ½ inches deep. The Sony UP-897MD series printers feature a new user-friendly front-panel functionality. A jog dial enables the user to easily scroll through menu functions, and the printers' memory has been increased to 10 MB to accommodate higher volumes. A "resize-to-fit" feature allows the end user to enlarge an image to the desired size. 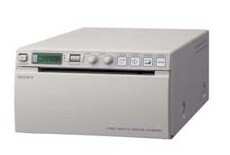 The Sony UP-897MD black and white video graphic printer is designed specifically for use with medical diagnostic equipment, such as ultrasound systems. The Sony UP-897MD packs power in a small chassis. High quality, photo-like prints are output in just approximately 2.0 seconds. The Sony UP-897MD is extremely small and light weight. For additional convenience the Sony UP-897MD adds a jog dial to the front panel for easy operation.